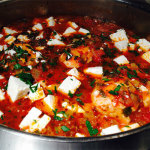 This is a really nice recipe that includes one of my favorite things which is Feta cheese. 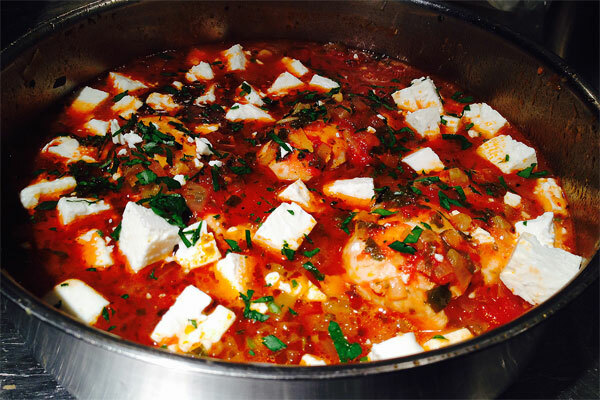 This recipe is rather Mediterranean but exactly from where is a bit of a mystery. A bit Greek, a bit Italian or a bit Spanish. Well it doesn’t much matter, as you can see from the photo is quite rustic and it tastes great. In a pan that has a lid saute the onions and celery until translucent. Bring to a steady simmer and add the chicken breasts, cover with the sauce and reduce heat and simmer gently with the lid on for 20 minutes until just cooked. Then remove from the heat. When ready to serve warm the chicken breasts gently and add the cubed feta cheese, sprinkle over the remaining 1½ tbsp of parsley and serve with rice or coarsely crushed potatoes to soak up the extra liquid. A good recipe and something you can get onto the t able quite quickly. I do get tired of writing about how fabulous my recipes are! Are They? You know the old adage about, "One man's meat is another man's poison". Well we really like it and of course I hope you do too. It's good with rice and boiled small new potatoes unpeeled and lightly crushed are excellent. The best vegetable I can think of to go with this would be oven roasted or pan roasted red peppers with balsamic vinegar.